Barry Whitehill is a contributor to Writers on the Range, the opinion service of High Country News. Now retired, he was deputy director of Yukon Flats National Wildlife Refuge, among other positions, and is a board member for the Alaska chapter of Backcountry Hunters & Anglers. At the far end of the Alaska Peninsula lies an expanse of public lands that provides vital habitat for bears, caribou and migrating waterfowl. It’s a sportsman’s paradise, but unfortunately, it’s also a battleground in the fight to protect designated wilderness against development. There’s a lot at stake: Any hunter who has experienced the Izembek National Wildlife Refuge, which is on the Pacific Ocean side of the Alaskan Peninsula, will never forget it. Stunning, snow-covered mountains frame lagoons and surrounding wetlands rich with wildlife and images that penetrate one’s soul. The refuge offers waterfowl and brown bear hunting that are unsurpassed. Twice, the federal government has studied construction of a road through the refuge and its wilderness area, and most recently the U.S. Fish and Wildlife Service did an exhaustive study of a proposed land exchange. And twice, the Department of the Interior decided that such a road would harm important fish and wildlife species, and that viable, non-road alternatives would serve the transportation needs of the community of King Cove, whose population is about 790. Izembek National Wildlife Refuge is rich with sensitive wildlife that should remain protected. Yet as recently as this May, Alaska Gov. Bill Walker listed the road as one of his transportation priorities. And according to a story published in The Washington Post on Oct. 15, the Trump administration has secretly backed a land swap between the federal government and King Cove Corporation, which would allow construction of the controversial road. The town of King Cove says the road has long been needed so that ambulances could drive to the airport in nearby Cold Bay during emergencies. But passage through the wildlife refuge was initially conceived decades ago as a project to boost the town’s commerce. King Cove passed a resolution to that effect in the 1980s, and road proponents long have touted its potential economic benefits. Walker recently agreed, telling Trump that the Izembek road would enable “access to health services and movement of goods and people between King Cove and Cold Bay.” Critics say that despite claims that a road would be used only in emergencies, it could also be used by all manner of vehicles, including trucks hauling fish caught by the region’s commercial fleet. 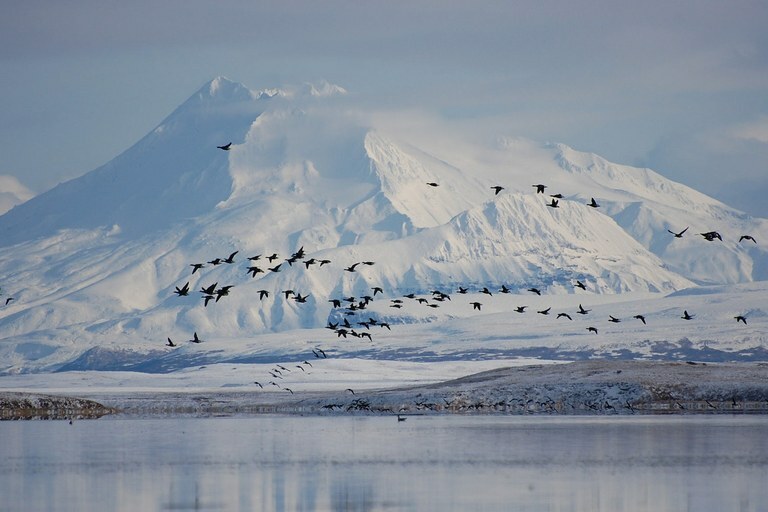 If allowed by Congress, construction of a road through the heart of Izembek’s wilderness lands would set a precedent endangering refuges and wilderness areas everywhere. The King Cove Road Land Exchange Act (H.R. 218 and S.101), undermines numerous conservation laws, including the Wilderness Act, National Environmental Policy Act, National Wildlife Refuge System Improvement Act and Alaska National Interest Lands Conservation Act. Izembek National Wildlife Refuge belongs to all Americans and is a place like no other. Its saltwater lagoons contain one of the largest eelgrass beds in the world, providing food and habitat for fish and crabs that feed migratory birds from multiple continents. During spring and fall migrations, this beautiful, windswept landscape explodes with life as virtually the entire world population of Pacific black brant and emperor geese, along with a significant portion of the threatened Steller’s eider population, stop to rest and feed. At a time when public lands across the nation are under attack, we owe it to ourselves, our kids and our grandkids to protect the integrity of our wild areas that help provide subsistence resources for local communities. With the science saying that no road should be built through the Izembek Refuge, it’s time for Alaska to agree.